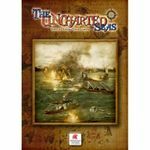 "The Uncharted Seas is a fast paced, action packed game of naval tactical combat set in a world of high fantasy. Using superb resin and white metal miniatures, and controlled by fast and easy to learn rules, the game allows you to wage war with fantastical squadrons of mighty warships. Choose from one of several races, including the Iron Dwarfs with their steam powered ironclads, Orc Raiders with their grotesque machines of war, the ever powerful Dragon Lords, an ancient race of magical seafarers, Imperial Humans hell bent on grabbing as much land as they can and the Thaniras Elves with their sleek ships of war."